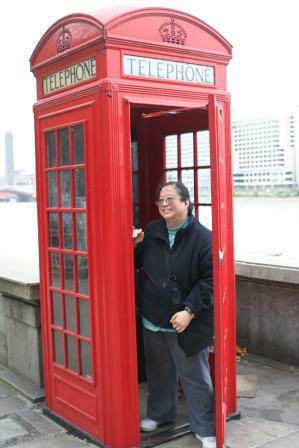 The trip was for Wanda and I to see London and Paris while on vacation. 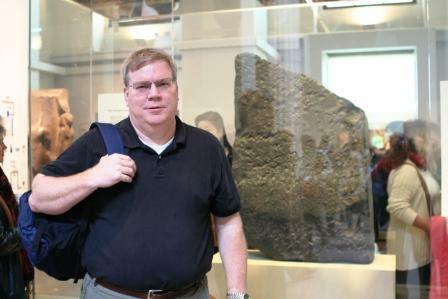 We had been planning it for years, but the kids had decided they preferred going to Tokyo, which we did in March 2008. Using points from airline travel and purchases through various reward credit cards, we were able to get the flights and hotel rooms mostly on points. This was a big savings in the cost of the trip - almost $4,700. We could have bought more items, but it did not seem reasonable with the shipping costs. Total expenses paid before the trip, including the airline fees, is $1,538.32 . Just a note before starting. I took over 3,600+ digital pictures while on this trip, so there is no way that all of them will be here. I am trying to make the most interesting available and will add more later on. Items that really helped with this trip. One of the big changes that has been made in the last couple of years in Paris and London has been the laws that does not allow smoking in restaurants and hotels. Left home around 8:30 AM and arrived at the Park 'N Fly lot at 9:20 AM. Took the shuttle to the airport terminal and there was no line for check-in. We checked our two large suitcases and carried on a small suitcase with our backpacks. We packed a second smaller bag in one of the large ones to use on the way back for items we bought. Done with check-in in about 10 minutes and through security about 15 minutes later. Boarding began at 12:05 PM. United flight 5820 left Houston Intercontinental (IAH) on time at 12:25 PM and we arrived at Chicago O'Hare (ORD) at 2:55 PM. The gate was in Concourse F, so we took a shuttle bus across to Concourse C for the next flight. United flight 0928 left Chicago O'Hare (ORD) at 5:40 PM for the trip to London, England. They had changed the plane that was to be used and we realized that our seats were no longer in the Economy Plus section. A quick conversation with the head attendant on the plane got us swapped to the right type of seats before the plan was fully loaded. The extra inches of space is good to have on these long trips. United flight 0928 arrived at London Heathrow (LHR) around 7:25 AM (15 minutes ahead of schedule) in Terminal 1. It took quite a while to walk from the gate to Immigration. We waited in line for about 20 minutes before we got to one of the Immigration officers. We handed her the form that we had filled out on the plane and explained that we were on vacation (holiday), going over to the train station, and catching a train out of the country. She asked us what train station (St. Pancras International) and where we were going (Disneyland Paris). 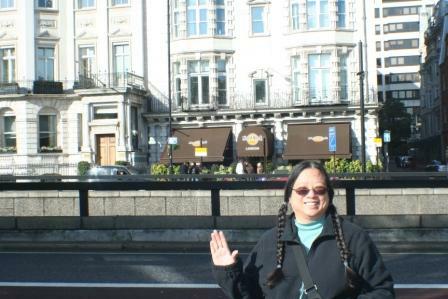 Satisfied with our answers, she stamped our passports after scanning them, and welcomed us to London. A short walk took us to the baggage claim and the luggage was just arriving as we were. We got our two suitcases and headed toward the customs desks. They were only checking people who had items to claim, so we just walked through. After leaving the arrival area, we came upon an area that had rental car, currency exchange, and transportation desks. We exchanged all our estimated money into Pounds and Euros. $1,340 dollars when into Euros and $1,760 into Pounds. This included our budgeted money for the trip along with each of our souvenir money. Note: we determined later that this was a mistake and it was one of the things we would have done different if we could. None of the places were offering very good exchange rates and we didn't realize that doing the Euro exchange in Heathrow would mean that they converted from Dollars to Pounds and then to Euros. It would have been better to wait and trade the Dollars to Euros in Lille, France than to do it at Heathrow. Ultimately, we decided the best rate would have been to just take large sums out of ATMs when we needed to and will do this the next time we go. Our $1,340 to go into Euros went first into £692.83 at the conversion rate of 1.9051 and then €801.00 at the conversion rate of 1.588. The $1,760 became £919.85 at the rate of 1.9051. This included some fees. A guarantee of buying the money back at the same rate was included, but so was additional fees. The going rate of Dollars to Pounds at this time was around 1.75 and Dollars to Euros was around 1.50. By the time we left to return to the U.S., it was around 1.6 and 1.28 respectively. We then went down the escalator to the tube station. Another 10 minute wait had us at the ticket station where we bought 2 Oyster cards for £30.00 each (£27.00 to use and £3.00 deposit). I asked for a visitor card, but they gave us the regular ones saying that there is no difference. The Piccadilly Line runs all the way from the Heathrow 1-2-3 station to the King's Cross tube station. We actually made it on the subway by 9 AM. Being early Sunday morning, there was not a lot of traffic, so it was easy getting over to King's Cross. The trip took 55 minutes, but was not crowded at all, which was good with our two large suitcases and the other bags. We used the Journey Planner from the Transport For London website at http://journeyplanner.tfl.gov.uk/user/XSLT_TRIP_REQUEST2?language=en for all of our planning for getting around London. The site also explains the Oyster cards. We arrived at around 9:55 AM. An underground passageway connected King's Cross to the St. Pancras International train station. With plenty of time to wait until our 12:57 PM train departure, we stopped at one of the delis in the train station and grabbed some drinks and Matt ate a breakfast sandwich (bacon and eggs). At 11:30 PM we headed for the check-in for Eurostar. Since we had bought the tickets through the internet, we had to get boarding cards from the ticket office. We then went through a security check point similar to those used at airports where they scanned us and the luggage. We then went through an Immigration point where they stamped us leaving the UK. 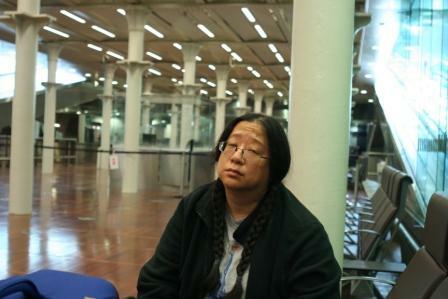 Wanda looking tired while waiting for the train. After spending some time in the waiting area, they opened up the escalators to the platform where we boarded the train. The luggage was put in a luggage area at the end of the car and our backpacks went into an overhead area at our seats. The seats were comfortable with room similar to what we had on the airplane. Eurostar Train 9132 left St. Pancras International at 12:57 PM and made one stop before going into the Chunnel (Channel Tunnel). It took about 20 minutes to get there and we then spent the next 40 minutes inside the tunnel. The last about 30 minutes was traveling to Lille, France. Once we arrived at Lille, we went through Immigration where they asked where we were going and how long we planned to stay. A quick stamp and scan of our passports and we were into the main station. The Eurostar station had been relatively easy to understand. The station at Lille was different. A large board had the upcoming departures on it, but did not list platforms until about 10-15 minutes before departure. Not knowing this, Matt went to two different information booths asking how to find the train we needed. Neither gave a complete answer, so he went into the main TGV ticketing office where one of the attendants understood the lack of knowledge about the train systems and explained what was expected and needed to be done. The Lille train station is where we found the first restrooms that we had to pay for. They were 50 cents each. This turned out to be common throughout the places we were in France (not Disneyland though), but were not seen but a couple of times in the UK. Pictures from the train stations and aboard the trains. At 5:25 PM, the platform for TGV Train 5298 from Lille to Marne La Vallee Chessy was put up on the board. We stamped our tickets (did not have to get boarding cards for the TGV trains) in yellow boxes at the entrance to the platform, and then boarded the train. The train left the station at 5:40 PM and the journey lasted a little over an hour. 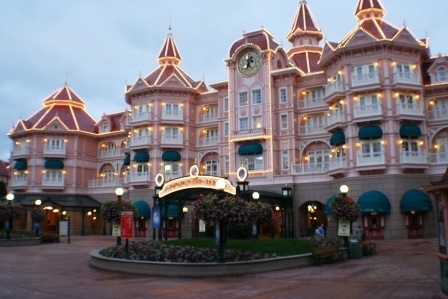 We arrived at Marne La Vallee Chessy station (Disneyland's) at 6:48 PM. We located the buses to the hotels and boarded the one to the Holiday Inn. It was not crowded for this trip, which we were very lucky. I never saw them that empty the next three days. The check-in to the hotel went quickly and we were in our room by 7:30 PM. After putting the luggage in the room, we went to the hotel's restaurant and decided not to pay for a buffet. Neither one of us were really hungry, so didn't want that much food. We checked the bar, but they did not serve food. We didn't want to order room service because the hotel added a €15.00 service charge to all room service orders and that seemed too excessive. We decided that neither one of us wanted anything and went up to the room and it wasn't long before we went to bed. Pictures from the Holiday Inn at Paris Disneyland. The next thing we knew, it was 9:30 AM and we had planned to be out and over to the Disney hotel, so had overslept some. We were out of the room by 10:30 AM and check out of the hotel. Even though we used Priority Points for the hotel night, there was a €3.30 local city tax we ended up having to pay. There was a large crowd waiting for the shuttle bus, which arrived from the other hotels on the line already full. 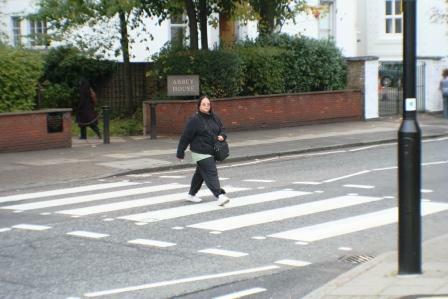 We first attempted to walk, but changed our minds at the front gate to the hotel and went back to call a taxi. The taxi cost €15.00 for the short trip to the Disney Santa Fe hotel and was well worth this unplanned expense. We waited in line about 20 minutes and got checked into a room that was ready for us. They gave us our tickets for our stay and we made reservations for the breakfast buffet that was included in our package. We walked some and found our building and room. The Santa Fe is one of their economy hotels and was on the scale of a Motel 6. We got on the shuttle bus and arrived at the Disney Studios. This is a shuttle that just runs between the Hotel Santa Fe and the bus area near the Disney parks. 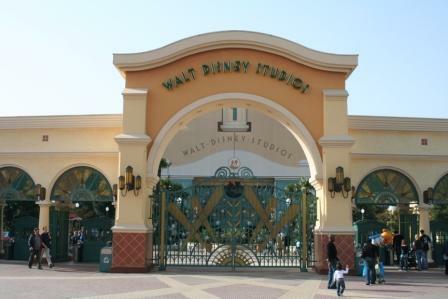 The area that you arrive at has the train station and bus loading area, the entrance to the Disney Village, as well as the entrances to the Walt Disney Studios and Disneyland parks. We had to go through a bag check into the Disney Studios and then through the ticket counters. The building that you have to go through to get into the park is Studio 1. Inside it on the right was En Coulisse, the largest restaurant (counter service) at the Studio. On the left is one of the Disney stores and to the far left is the restrooms. There was hardly any line for the counters when we arrived and we decided to grab something to eat before continuing. We both got a burger, fry, and drink combination. Following us spending the rest of the day (until closing at 7 PM) at the Disney Studios, we decided to eat at Annette's Diner at the Disney Village. 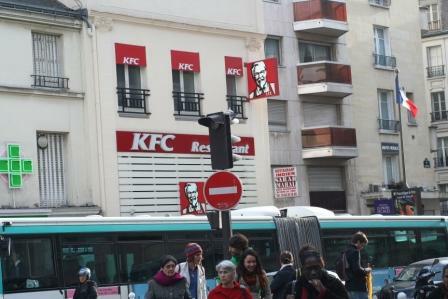 This was one of the restaurants on the half-board meal plan that we purchased with the hotel reservation. The diner is modeled after an American 1950's diner and served mainly hamburgers. The half-board meal only covers the classic burgers, which we didn't realize before going in. They had outfits similar to what you would expect from a diner of that era and some of the wait staff served on roller skates. It was a popular place and we ended up waiting about 30 minutes from the time we got in line and we were taken to our table. We decided afterwards that it would have been better to have used the half-board meal plan at another of the restaurants instead of just for burgers. Supper would have cost €38.00 normally. After the meal, we decided to walk through the village area and see what stores were there. We then went back to the hotel and called it a night. We got up early and headed for our 7 AM reservations for the breakfast buffet at the hotel. Pictures of the buffet can be seen in the link above for the Hotel Santa Fe. After eating, we caught the bus over to Disneyland to take advantage of the early entry at 8:00 AM for hotel guests. The above picture is of the Disneyland Hotel with the entrance to the park through the ground floor or over on the right-hand side. For early entry, we had to first go through the security bag check and then to the entrance on the right-hand side of the hotel (normally the group or employee entrance). Our half-board meal (part of the plan we purchased) had a reservation at the Garden Palace in the Disneyland Park for lunch. This was a buffet of French style food and was decent in content. Lunch would have cost us €49.00 if we had paid for it. When the park closed at 7 PM, we went back to Disney Village to eat at the McDonalds there (cheapest place available) and shop some at the Disney Store. Afterward, it was back to the hotel to get some sleep for another early day. Another early day to start off with the breakfast buffet at the hotel, but we didn't head to the Disneyland Park for early entry. Since we were leaving after the parks to go into Paris, we went back to the room after eating and finished packing. We then checked out of the hotel and stored our bags in the luggage storage area (picture in the link for the hotel above). While there, we were asked if we wanted to have the bags sent to the train station for €4.50 each, which we decided would save us the hassle of coming back to the hotel, get the luggage, and transport on the shuttle back to the train station. This also turned out to be a good idea and saved us some time and effort. 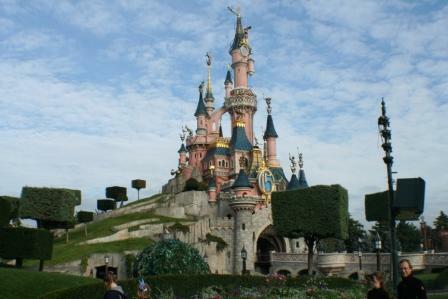 We went to the Disneyland Park with the intent of seeing a couple of things that we had not seen the previous day. The first thing we did was to stop by Salon Mickey. This is a special entrance for owners of Euro Disney stock and I had intentionally bought stock and joined the shareholder's club earlier in the year so that we could stop by this place. It does not offer a lot, but one of the benefits of being a club member is discounts throughout the park. The main objective of going back to Disneyland was to see the Legend of the Lion King show, which proved to be the equivalent of a shorter version of the Broadway musical that is on tour. As with the Animal Kingdom park in Orlando, it has it's own stage set up and only does performances at specific times and sometimes specific days. It was not being performed on Tuesday, so that required the wait until today. It is in a large amphitheater with about 500 seats looking directly on the stage in the lower part (which you have to wait in line for), or several more hundred at tables higher up being used by people who are eating from the counter service restaurant attached to it. Those tables did fill up quickly, so I'm not sure how soon you would have to be there to get a table. This is an excellent show and should not be missed. Before this show, we did go by the Honey, I Shrunk the Audience show (pictures on the Disneyland link from the previous day). This is similar to the shows in the other Disney parks. Each of the seats toward the back have earphones that allow the user to select various languages to hear the show, so we were able to listen to it in English. After the Legend of the Lion King show, we went back to the Disney Studios with the main intention of riding Crush's Coaster and Armageddon. These are the things we had not completed on Monday and wanted to try them. Pictures for both can be seen in link on Monday for the Disney Studios. Completing all this, we then left the park and walked over to the train station. We had to go to the Disney Express area to get our bags from them. Then back down to the main ticket office to get tickets for both of us to go into Paris as well as a carnet of 10 tickets to be used while in Paris. The carnet offered a cheaper per trip price than buying them individually. Unfortunately, the ticket from the carnet could not be used going into Paris from the Disneyland parks and they could not be used going to Versailles later due to the zone it was in. Those trips required buying additional tickets. We had looked at the travel passes that were being sold, but they just didn't prove to be cost effective for what we were doing. After getting the tickets, we hopped onto the RER-A line from Gare de Marne La Vallee Chessy train station to Gare de Lyon train station in Paris. We then transferred over to the M-14 metro train to the Madeline metro station. We then made a second transfer over to the M-12 metro train to get to our Convention metro station stop. The stations at Marne La Vallee and Gare de Lyon had escalators and elevators to get to each level needed. The Madeline station did not have all that was needed and some stairs had to be negotiated. The Convention station does have a set of escalators going up to the street level, but none going down, which we had to negotiate when we left on Sunday. Train and metro ticket to cover the trip from Marne La Vallee Chessy to the Convention metro station in Paris. We had planned to do the Hop-On/Hop-Off bus tour today, but it was raining. 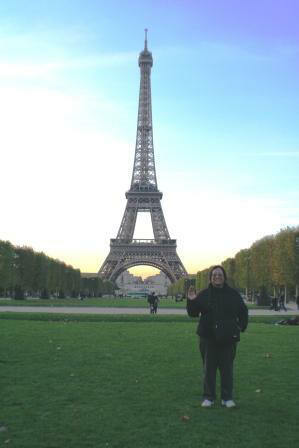 Instead, we decided to go to the Louvre and start our Paris sightseeing there. This was our first use of a carnet ticket. Metro t-ticket from a carnet. We went to the Palais-Royal (Musee du Louvre) metro station and took the underground passage to the Louvre. Since we arrived as it was opening, and there was a line to get through the bag check security, we took a set of escalators up to a food area next door and split a muffin and drink between us as we waited at an open cafe (CafeWest). Matt and Wanda outside the Louvre pyramid. Through security we entered a large open area that was the central underground site of the Louvre. We weren't sure where to get the audio guides, so tried the escalators up to the main entrance through the pyramid, but realized that wasn't right. We went back down and stopped by the information desk to grab a map. We then went up another set on the Denon side to start with the Mona Lisa, but after getting the audio guides from a nearby stand, security closed off the entrance to that section and we had to leave to go into the Sully side instead. The Denon side did open back up later on. Part way through the museum, we decided to get lunch. After looking at the options in the Louvre, we went back to the food area just outside of the underground entrance. We both selected a French rotisserie called La Rotisserie and had both of us had the Rustique meal, which consisted of half a chicken, vegetables, bread, and a drink. 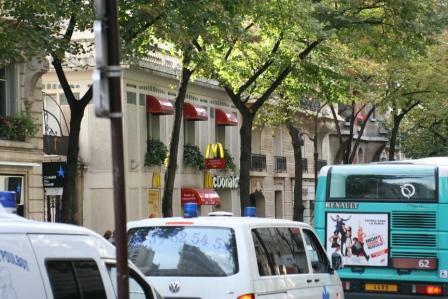 Fast food places near the hotel. Metro entrances and platforms seen during the day. Got up and took the subway over to the Opera metro station to buy the L'Open Hop-On/Hop-Off Tour bus tickets from their main location. Notre Dame as you walk toward it. Whistler's Mother by James McNeill Whistler in Musee d'Orsay. The writing on the cows are in English. The left one has "LIFE IS A DREAM MAKE IT REAL!" and "BIOART" on it. The right one has "LOVE IS ALL!" on it. Lunch at Subway across the Seine from Notre Dame. 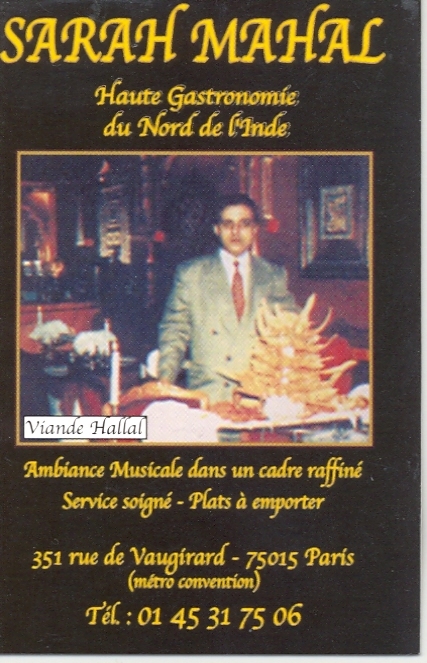 The Italian Restaurant where we ate supper at near Bir-Hakeim Metro Station after visiting Champ de Mars Tour Eiffel. This day was our trip to Versailles. We had to buy extra tickets for the metro and train to get out to Versailles due to it being in a different zone. 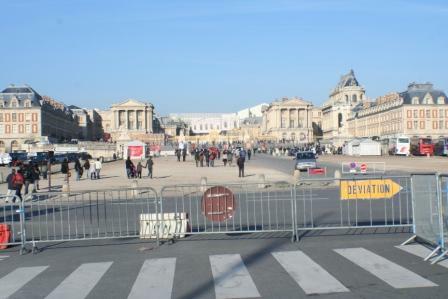 Once in Versailles, we had to walk about 15 minutes to get to the palace. We had to go through another security and bag check before entering the palace grounds. We found an information desk for a map and the lady told us about the reduced cost for a combination Garden and Audio Guide ticket. 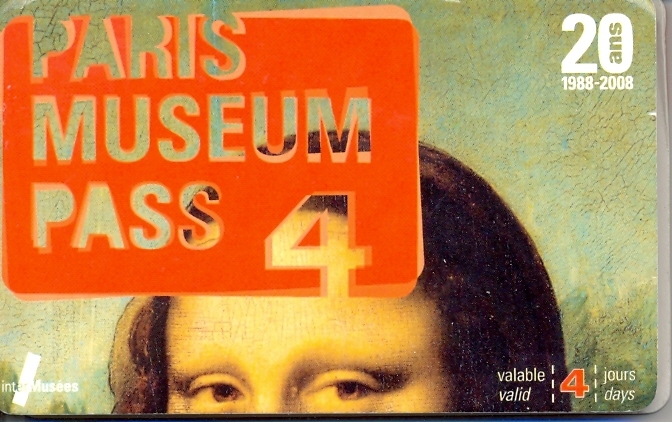 Our museum pass covered the main building, but not the other stuff, so we decided to go ahead and get this ticket. After a lot of walking, and getting around 2 PM, we decided it was time for lunch. Lunch was eaten at La Grandiolle, which is an outdoor restaurant in the Versailles garden. After eating, we debated whether we wanted to stay a couple of more hours until the water fountain show in the gardens or just leave. We opted with leaving and going back to the hotel. After returning from Versailles, we rested for a couple of hours and then decided to eat at an Indian Restaurant that was across the road from the hotel at 351 rue du Vaugiard. Afterward, we stopped by a local market and bought a couple of drinks to have at the hotel before going to bed. We were up early to pack, check out of the hotel, and get over to Gore du Nord train station to catch the TGV train to Lille. We used the last of our T-tickets from the carnet for this trip and took the M-12 from Convention to Montparnesse Bienville and then the M-4 to Gore du Nord. After arriving at the train station, and finding the right platforms to be at, we decided to have breakfast at one of the cafes. We grabbed a couple of drinks and bread items to eat. After waiting a while, we boarded our train to go to Lille. TGV train 7029 left Paris Gore du Nord at 9:58 AM and arrived at Lille, France at 10:57 AM. During the train ride, a couple of railroad personnel came into the car and went to either end of it. They then started looking at the tickets each person had. We were facing the front of the car with one set of seats behind us. Only one person was sitting directly behind us and that is the person that the railroad person started with from our end. The other railroad person got to us to inspect our tickets before the one behind us finished with his first person. Not understanding French, it was hard to tell what was happening, but with all the muttering the inspector was doing, it was obvious he did not like the ticket the person had shown him. I believe they made the person pay for another ticket (and fine?). At Lille, we had about an hour-and-half to wait for the next train. We figured it would be about an hour before they started checking in and boarding people on the EuroStar train, so we went and got lunch at a Welsh pub in the station. The waitress here was the only person I believe we dealt with in France that did not speak some English. We pointed to what we wanted, used our few words of French, and she ended up bringing us all we asked for. After eating, the check-in for our train was announced within minutes. We walked to the EuroStar area and went through both French and UK Immigration booths, then had our bags and ourselves going through security scans before going into a waiting room. We only spent a few minutes before they announced that the train was ready to board. Most everyone was going down a set of long stairs to get to the platform, but we saw an elevator nearby and they let us use that with our large bags. We found the baggage area in the assigned car pretty full of bags already, but I rearranged a few items to make ours fit. We then went to look for our seats and found other people sitting in them. When we checked in, they had put a sticker with different car and seat assignments due to taking some cars out of service. However, they had not correctly identified where people should be and double-booked quite a few. A EuroStar attendant saw the problem and had everyone boarding go into the next car, which was empty. After the train started, I moved our luggage down closer to us in the new car. EuroStar 9127 left Lille at 12:35 PM and arrived at London St. Pancras International at 1:03 PM. There is a one hour time difference between Lille and London. Nothing special happened on this leg of the trip. After getting to London, we went through the underground tunnel to King's Cross tube station and caught the Piccadilly Line to our hotel. We had planned to get off of the tube at Earl's Court, which had handicap access and as such would have elevators. However, we ended up getting stopped at Gloucester when a red light further out caused the line to be stopped in place. They indicated it was going to quite a while before the tubes would start up again, so we decided to get off. The hotel is in between Earl's Court and Gloucester, but Gloucester only has one elevator between two different lines, not to street level. We ended up carrying our luggage up several sets of stairs to get outside. A 10 minute walk brought us to the Quality Inn Kensington for our next eight nights. After getting checked-in and cleaned up, we went out and ate at a local Chinese restaurant called Dragon King that is located near the Earl's Court station. It was okay, but nothing special. We had originally planned to the do the hop-on / hop-off bus today, but it was raining, so we decided to make it a museum day instead; though we modified the plan as we went. We took the tube from the Earl's Court station over to the Mansion House station. Our intent was to walk over the Millennium Bridge to get to the Tate Modern. However, as we approached the entrance to the bridge, we found that it was closed for the door for maintenance checks. This meant we had to continue our walk to the Blackfriars Bridge and cross it instead. After doing that, we noticed a Starbucks and decided to take a break and grab some hot drinks and share a muffin. 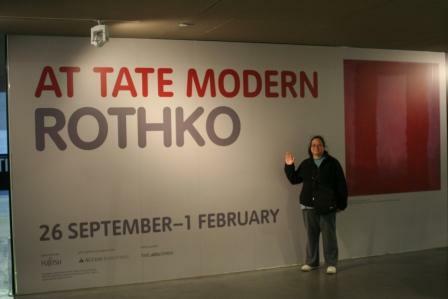 The Tate Modern would only allow photographs to be taken within the main hallway, so no individual pictures were taken of the art work. This museum was interesting, but had a lot of school groups at it. We did use audio guides at this museum and they did help with understanding the different exhibits. Following lunch at the Cafe 2 of the Tate Modern, where Matt had the classic Fish and Chips, we decided to go to the National Gallery instead of the Tate Britain. We had originally planned to take the Tate Boat between the Modern and Britain museums, but this change meant we could not do this. Since we were in the vicinity (matter of perspective) of the Temple Church, we made the decision to walk back over Blackfriars Bridge to the Temple area since it was not raining at the time. It turned out to be a longer walk then planned. For those of you who don't know what the Temple Church is, it was built in the 12th century for the Knights Templar to use as their English headquarters. It has a set of effigy tombs to commemorate their fallen companions and is comprised of two sections: the Round Church where the tombs are and the Chancel, which is used for services still. One of Henry III's infant sons is buried within the walls of the Chancel. 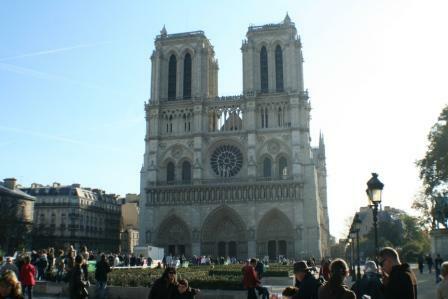 This church was made more famous by being a focal point in the movie, The Da Vinci Code, by author Dan Brown. The church was not easy to find since it is in a small courtyard in the middle of the Inner and Middle Courts; two of the Inns of Court (i.e., lawyer offices) that surround the Royal Courts of Justice. Pictures are allowed within this church and they can be seen by following the link below. 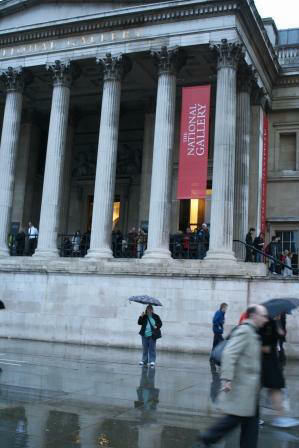 It still wasn't raining when we finished with the church, so we then walked down the Strand to Trafalgar Square to visit the National Gallery. On the way to the square, we passed the Australia House, which was featured as Gringott's Bank in the Harry Potter movies. 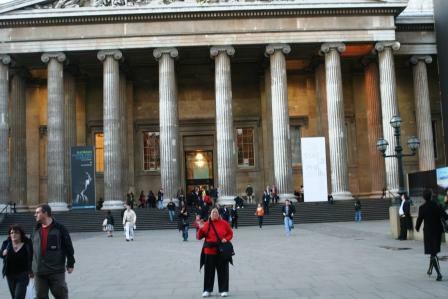 At the museum, we got a couple of the audio guides, but also used Rick Steves' tour of the National Gallery in his 2008 London book. We stayed until the museum closed and didn't get to see everything. Photography was not allowed in the National Gallery. Following the museum visit at the National Gallery, we took the tube from the Charing Cross station to the Gloucester station. Since it was raining again, we grabbed a quick meal at the Burger King across the street from the tube station and then walked back to the hotel to call it a day. 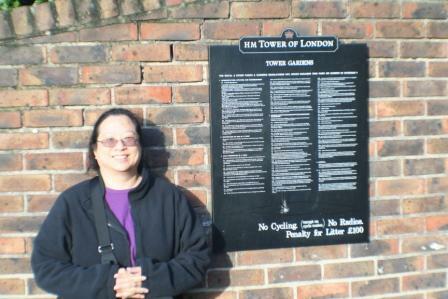 We left the hotel around 9 AM and traveled from Earl's Court station to the Tower Hill station. After buying the entrance tickets and stopping by the Welcome Center, we went into the front gate, handed them our tickets and allowed the guard to search the bags, then waited about 10 minutes by the sign for the guided tours for the next one to start. The Beefeater's Tour, led by a Yeoman Warder, is about an hour long tour throughout the main part of the Tower complex. These Yeoman Warden are officially titled "Yeoman Warder of Her Majesty's Royal Palace and Fortress the Tower of London, and Members of the Sovereign's Body Guard of the Yeoman Guard Extraordinary." There are currently 35 Yeoman Warders and one Chief Warder that acts as ceremonial guards of the Tower and tour guides. All have been retired with 22 or more years of service in the Army, Royal Marines, or Royal Air Force and served as senior non-commissioned officers or warrant officers. No photography was allowed within the Jewel Tower or in the Chapel. We did not rent the audio guides at this location, but used Rick Steves' book for some information. The Yeoman Warders allow photographs during their tour, but no video recording of their presentation. Following the tour, and after exploring various buildings such as the Jewel Tower and the White Tower, we ate lunch at the New Armouries Cafe. 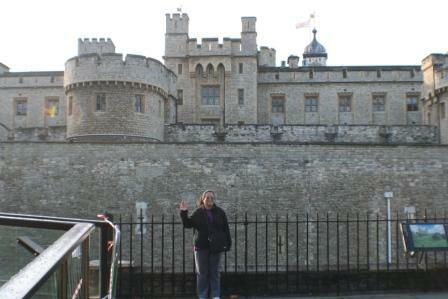 Following lunch, we left the Tower of London and took the tube from Tower Hill station to Westminster station. 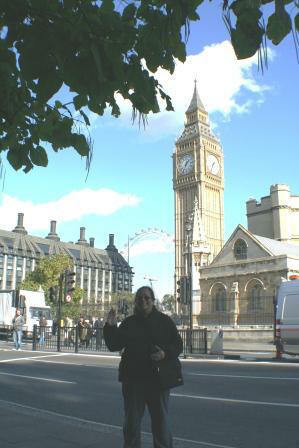 We came out of the station opposite of Big Ben and Parliament. A short walk brought us over to Westminster Abbey where we entered following a bag check, bought our admission tickets and then were given audio guides to use. These turned out to be a good resource and were a pleasure to use. Instead of costing extra as the website stated, they were being given to everyone who wanted to use them. 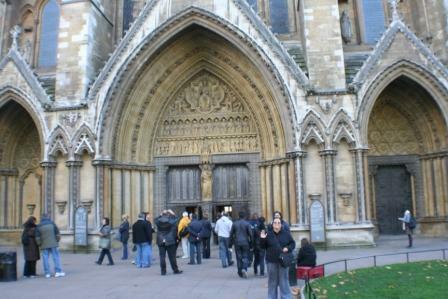 Westminster Abbey is a fascinating church with a lot of history in it. There was a large crowd inside, but we were able to see everything. A snack area is located outside in a courtyard for a break when it is needed. We stayed until almost end of the visitor period. We then went back to Westminster station and traveled to King's Cross station and walked to the British Library. This library, does not allow photography inside the exhibit room where the collection is held. These include a copy of the Magna Carta (they actually have two here), Leonardo da Vinci's notebook, manuscripts of Beatles' songs, and various Dickens and Shakespeare original works. It did not take a long time to look through, but what we did look at was interesting. After leaving the library, we went back to King's Cross station and took the Piccadilly Line back to Earl's Court station. We had noticed a Portuguese restaurant named Nando's near to the station and decided to try it. They had a 2-person platter that contained a full chicken that was cut in quarters, two sides, and allowed free refills on their sodas. After having to go over a week with limited drinks during meals, this was a pleasure. The Portuguese beer was tasty also. This day was when we decided to finally do the Original London Bus Tour. This is a hop-on / hop-off bus that goes over various established routes similar to the Paris one. There is also the Big Bus Tour that is similar, but we selected this one. 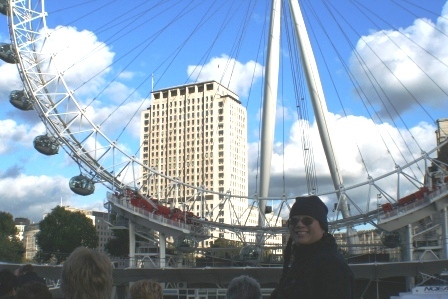 It also included admission to the City Cruises on the River Thames, which we planned to use later to go to Greenwich. We traveled on several of the routes until we decided to eat lunch at the Hard Rock Cafe. Following lunch, we spent a short time on a tour given by the Cafe's Vault Keeper, Jimmy. Jimmy was informative about the treasures in the vault and seemed enthusiastic and passionate about their collection of rock items. This is well worth the effort to go to this location. The vault is actually below the Hard Rock store across the street from the Cafe. We went back on the bus tour and around 6 PM ended up near Westminster Pier to board the City Cruises Boat Tour. We took this cruise up the River Thames to Greenwich. At Greenwich, we stopped at another Starbuck's for hot drinks and then caught the Docklands Light Rail from the Cutty Sark station back to Earl's Court station. Tonight we decided to eat at another Chinese restaurant near Earl's Court station named Dragon Palace. It was a lot better than the one we ate at on Sunday and had been recommended by one of the travel websites. Today was our "off:" day and we didn't have anything planned but supper reservations. We decided to go over to Harrods of London around lunch time and do some shopping. A quick tube trip from Earl's Court station to Knightsbridge station had us at the store. We looked around a little and then decided to eat at the East Dulwich Deli on the 5th floor. Decent food, but not a lot of choices. Wanda bought a Burberry scarf there that was to be a gift for our daughter. Matt bought some English chocolate to share with people at his work. The food hall was very large and had interesting selections. Several areas included antique furniture, collectibles such as rocks and fossils, and other expensive department store items. Harrods has become a tourist attraction in its own right and there were a large amount of tourists there buying things to take home. Before we left the store, it was recommended to us to head to their customs tax office to get help to fill out the forms for a refund of the VAT taxes. They did it in only a couple of minutes and all we had to do was get it stamped at the customs office in the airport before leaving and dropping it in the mail. Harrods has made this very easy for the customer. Supper was to be a meal at Gordon Ramsey's Devonshire Pub. The Devonshire is located west of Kensington, where we were staying, in Chiswick at 126 Devonshire Road. We had to take the Piccadilly line west to the Turnham Green station and then walk about 15 minutes. The pub wasn't completely filled while we were there, but it wasn't far from being so. The food was excellent and included wild boar, veal, liver, pork, spinach, and mashed potatoes for our meal. The starters we selected were the wild boar and pistachio terrine with prunes and bacon (Matt) and chicken liver pate with toast (Wanda). Matt then had the braised veal shank with saffron pearl barley with a side of mashed potatoes. Wanda selected the pork and apple bangers with mash and a side of spinach with shallots and garlic. Bangers are sausages for those who are not familiar with the term. A desert split between the two of us consisting of a apple charlotte with cinnamon ice cream completed the meal. A glass of London Pride beer and another of Leffe Blonde beer helped round out the meal. The first was recommended by our waitress, Sarah, and the second by the manager. We would definitely go back to it if in the area. 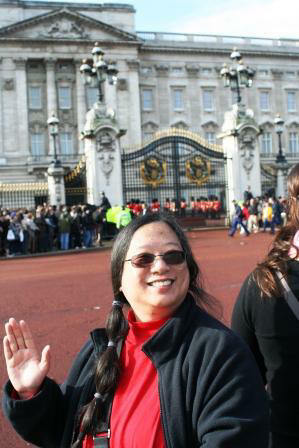 Wanda in front of Buckingham Palace during the Changing of the Guard Ceremony seen through the gates behind her. 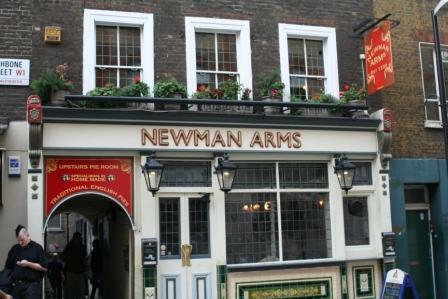 The Newman Arms is a small pub and restaurant known for its meat pies and located at 23 Rathbone Street not far from the British Museum. Unfortunately, we didn't make reservations first and it was full when we got there. The website can be found at http://www.newmanarms.co.uk/ . We had wanted to try some of the traditional meat pies here based on a description in the Timeout book 1000 Things To Do In London (#3 on page 12), published by Time Out Guides, Ltd., 2007. Rainy day today. Did not get any outside pictures. Monday was the day to check out of the hotel and grab the tube back to Heathrow Airport. We were checked out of the hotel by 9 AM and our luggage over to Gloucester station. We actually let a couple go by before getting on one due to the amount of people in them before getting on the Piccadilly Line. The trip took about 35 minutes and we arrived at Heathrow around 10 AM. We took the time to exchange most of the money back into U.S. dollars and then went to check our luggage in. Our flight was United 919 leaving Heathrow at noon and arriving Dulles Airport in Washington, D.C. at 4:33 PM (8 hours, 33 minute flight). Going through customs and immigration was easy at Heathrow and we had plenty of time to wait for the flight. The gate was not assigned to the flight until about an hour beforehand and we had to walk a distance to get to the right gate. We arrived at Dulles around scheduled time and had to pass our luggage through customs there. Not much of a wait (no more than 15 minutes) and then a bus ride and walk to the next gate. We grabbed some Subway sandwiches until we boarded United 7605, which left at 6:40 PM and arrived at Houston Intercontinental a few minutes early (scheduled time was 8:56 PM). The actual flight was right around 3 hours long. We had one more surprise to end the trip. One of our suitcases did not arrive on the plane with us. Wanda's suitcase turned out not to arrive and the United luggage office stated that it must have been pulled for customs inspection and didn't make the flight at Dulles. It is interesting that the one notice placed in our bag (a requirement by law) was in one of the bags that made it. The bag was brought by the house on Tuesday and it did not have a notice and did not look like TSA or Customs had opened it. I think the plane was overloaded and they just did not want to tell us that. Finding out about the luggage ended up delaying us from leaving the airport quickly and we ended up not getting home until about almost 11 PM after picking up the SUV at the parking lot. At least the shuttle bus was quick. Exchanged money back into dollars at Heathrow Airport.